This ride covered over 80 miles, and needed 2 trips to complete because I kept stopping to take pictures and notes, pass out Cycling Dude Flyers, and to talk with other users of the trail. This ride is a joy to take, from top to bottom, in either direction, and you will learn a lot about the communities it passes through, and about the environment. Answering this question is the first step toward completing the last leg of the ride and makes all that you experienced getting to that point worth the time and effort. At the end of this series is a discussion of getting to and from (Link to come!) but, for now, let's hit the road. 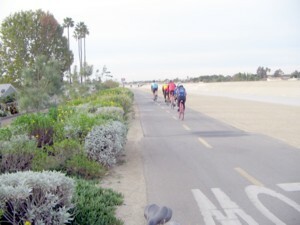 The Santa Ana River Bike Trail begins on the north side of the river, at the border of Huntington Beach and Newport Beach and there are 2 entrances: 1 on the East side of Pacific Coast Highway, 1 on the beach side. The beach is Huntington State Beach, a well-known site of a nesting sanctuary for the California least tern and across the street from the Huntington Beach Wetlands. 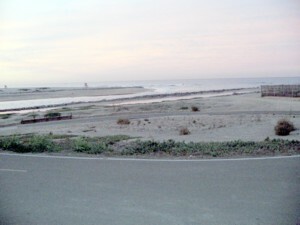 At the south end of the beach there is ample parking and restrooms. Entering the trail from the parking lot, at 630am I take one last look at the ocean waves, head under PCH, cross the officially marked start of the trail and pedal off into the sunrise. At 1 1/2 miles the ocean water begins to resede and yet birds of all persuasions still can be seen hanging out, doing whatever it is birds do, in the river. At 2.46 mi. the trail crosses a bridge to the other side of the river. After riding past homes, Talbert Nature Preserve, an entrance to the related Fairview Park and a golf course, the trail dips down off the high ground, overlooking the river. At 4 1/4 mi. I encounter the "Next Great Tennis Phenom"! When I tell him that playing tennis in this spot was not safe, for him, or for others, he just stares at me, says "oh, yeah?" and returns to whacking his ball. At 4 1/2 mi. you get your first glimpse of how Mother Natures march to the Sea has been briefly interupted by the hand of man. 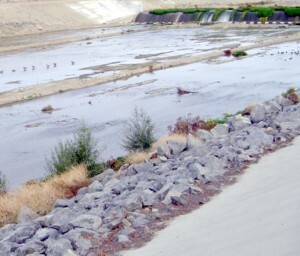 The concrete channel is master for miles, in this part of the OC, except for a couple of accomodations before reaching Fullerton. By 9 1/4 miles, when I pass 5th Street and see the homeless encampment and its many bicycles, on the other side of the river, I have passed housing, businesses and a couple of schools. All along here I find the first indication of the nice landscaping along the trail. Having alreading encountered a few cyclists along the way, including a couple of chaps named Ralph and Billy, I was now beginning to encounter Group Rides. The groups of spandex clad riders ranged from 3 cyclists to as many as 15 and I saw the last of them as I left Santa Ana and headed into Anaheim. It was near the First Street underpass that I encountered the largest group, traveling hell bent for leather, closely together, at well over 20 MPH, heading south. They were traveling too fast for a picture, but I had time for a smaller group bringing up the rear, at at more leisurely 12-15. Why a group like the first one would choose to speed along the river trail is a mystery to me. The risk is always there for disaster. 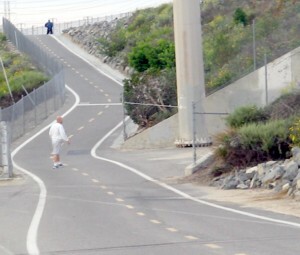 Not only do you have idiots like the tennis player, there are the occasional homeless on the trail side of the river and on weekends, near the soccer fields, kids playing on the trail and in the river, especially at the underpasses. It is now around 8am and the last 3 groups of riders pass me by. Along the way I've had several chances to pass out flyers about this blog to cyclists, including a group forming up near the golf course. As I leave the golf course behind and pass Anaheim Stadium and Honda Center, I realize that the river, now with the flow heading south, has dirt, rocks, and other natural and manmade left overs from the rainy season. 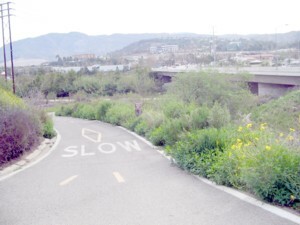 At just over 14 mi., at Katella, the trail crosses the river again to the east side, at a small park, and there is a bathroom (But be careful as sometime homless hang out at a nearby bench.). Flowing water, flowery weeds and bushes now appear in the river as I pass industrial outposts on my right before homes return. At 17 mi. the trail becomes lined with trees for a while. At 21 1/2 mi. 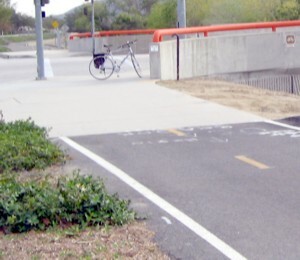 the trail returns to the north side of the river, just beyond Imperial Highway. At 22 1/2 mi. 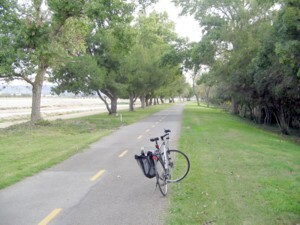 the river is really flowing, the freeway is on your right and Yorba Regional Park is on your left. Just beyond the Weir Canyon underpass the trail goes left and up a short hill, out of the river, to turn right alongside La Palma Ave. It is 930am now and I have traveled 24 miles. I find myself on street level for a bit because Ma Nature has taken over the river completely, then the trail gets close to the river again, with the street above me to my left. At 26 3/4 mi. I come to Gypsum Canyon Rd. Cyclists interested in continuing into Riverside County take note of that little brown sign on the wall in the picture: Turn right, here, because to go under the bridge and continue on the trail will lead somewhere else. Turn right, ride to the corner, and turn right again. Following the green signs, to the right, the trail enters Canyon RV Park, then heads into a narrow passage where the freeway is on my right, and the east end of Featherly Regional Park, on my left. 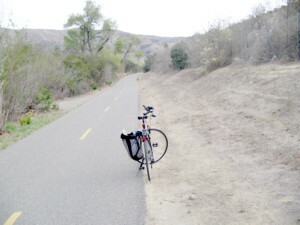 The last leg of the Orange County portion of the Santa Ana River Trail heads past the Coal Canyon entrance to Chino Hills State Park, and Green River Golf Club. Take a good look around because this is the last sight of the flowing river that you will see for almost 15 miles. The trail official ends at 29 mi., at the entrance to Green River Golf Club on Green River Rd., but my odometer reads 30. It is 1030am and I exit the trail, to my right, and ride up, up, up Green River Rd. back into civilization. 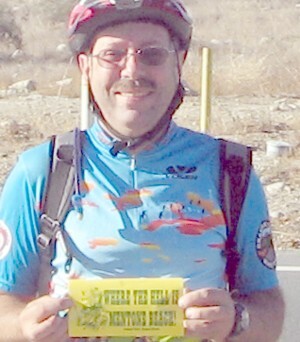 I enjoyed your Santa Ana River Article. I have a question though. I have been told that you can begin this same Trek beginning off of Green spot Rd, close to the Jerky Store. 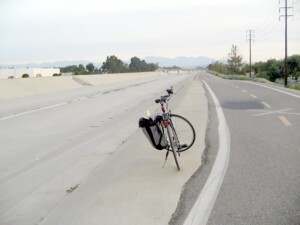 My kids (and me as well) want to bike from there to HB. I was hoping you would have exited from there. Have you heard of any info lately regarding this fact ? We live in Yucaipa (just off SR-38 like 5 miles from the Jerky Store) and I was hoping this was so, but I can't seem to find any truth to this online. I guess I will have to take a day and scope it out for myself to see if it is true. 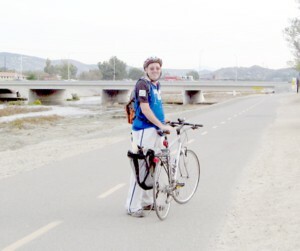 I didn't think we would have to ride surface streets all the way down to Colton or San Bernardino to start the trail. Anyway, Glad to have read your trip.